I met Ding one afternoon in 1992 at the S.P.C.A in San Francisco. I recently had lost my first dog, a border collie mix and was just looking to see if there were any border collie pups. There were no young border collies or mixes, so I started to head out the door. As I was leaving, I saw a sign that said “Large Breeds Upstairs.” A large dog was out of the question, but I decided to take a look just for fun. The large breed area was a U- shaped room with about 16 kennels. I walked in and the chaos began. In the first kennel was a female German Shepherd who started barking and then cage fighting with the dog next door. I walked from kennel to kennel and saw a variety of dogs, mostly mixes. As I got close to the last couple of spaces, I saw this interesting shepherd mix with one floppy ear, a question mark tale and a brindle coat. I stopped for a minute and stuck my finger in the cage and promptly received a rapid barrage of licks. I moved on to the last kennels and then headed out the exit. I didn’t think any more about the dogs as I drove home. When I arrived, I tossed my keys on the kitchen table and then something hit me. It was like a silent voice that shouted, “Go back and get that dog, the brindle shepherd mix with the floppy ear!” I really can’t explain the feeling, but I heeded the voice and hurried back to the S.P.C.A to adopt a big dog. When I got there I asked to see the dog from upstairs, the one they were calling “Hound”. I went into the meeting room and met “Hound” for the first time. They said he was a stray, found on the streets of San Francisco and was about 1 year old. The only other thing they knew about him, was he liked to swim, a fact that would be confirmed later. We played Tennis Ball fetch pretty much the whole time and I could tell he had absolutely no previous training, but he quickly learned the best way to keep the game going was to return the ball! After 5 minutes or so, he was sprinting back and setting it right into my hand. Not too much later we were on our way home. The first night, after sniffing every object in the house, he seemed satisfied and curled up on the rug and went to sleep. About 2 or 3 am I felt something up against me and awoke to find a large dog in my bed, stretched out length-wise and fast asleep. I didn’t mind. Now, the name “Hound” didn’t really fit his personality and he wouldn’t answer to it anyway, so I called him “Hey” until I could come up with a more suitable name. He was such a happy being, full of energy and curiosity. Every unexpected event would turn into a new game. Once I dropped a penny on the floor and he promptly picked it up with his front teeth, began tossing it into the air and catching it in his mouth. That became a regular game. Occasionally he would unknowingly swallow the penny and then scour the area looking for it, completely puzzled at its sudden disappearance. Another fun game was discovered at a BBQ, when someone flipped a bottle cap into a 5 gallon bucket of water. The next thing we knew he had plunged his head into the bucket and retrieved the cap! It wasn’t too long after that I began calling him Ding, for his zany personality in part, but also after a character from a 60’s cartoon show. Ding grew up to be an amazing friend and companion. He was extremely athletic and bright. He loved to swim in the ocean as well as jumping into any other body of water he might happen upon. Another favorite pastime was watching Animal Planet. He would stand in front of the TV and wait for an animal to make an appearance, especially dogs. You basically could not watch any show that had animals, without Ding running up to the TV, barking and leaving nose-prints all over the screen! 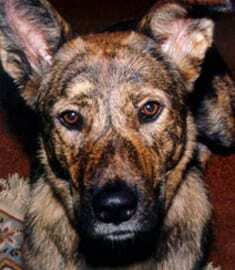 Along with his playfulness, Ding also possessed the innate qualities of the German Shepherd Dog. He was a loyal and fearless guardian and I had the immense blessing of sharing over 12 years of my life with him. He lived a full and healthy life until he past at the age of 13 and a half years. He was my best friend indeed. Shortly after Ding died, I had his DNA stored and he resides in the safe care of Viagen Pets. Knowing this has taken some of the sting out of his death.